Are YOU Ready for a Barrel Racing Breakthrough? The statistics tell us that only about 3% of entries at open barrel races clock in the 1D. Even fewer are competitive enough to stand a chance at the nation’s toughest rodeos and futurities. If you’re reading this, I’m sure you’re interested in doing everything you can to improve. But you may have found that after all the effort you’ve put forth, that your times still aren’t measuring up in competition. I’ve been there. We’ve ALL been there! It’s my guess that you’re ready to bust through limitations, and ready to take your barrel racing not just to the next level – but to the highest levels. You’ve listened with anticipation after a run, only to have your heart sink with disappointment when you heard your time. You’ve tipped barrels, some for so much money it almost made you cry. You’ve made blazing fast, perfect runs in practice only to have them fall apart in competition. You’ve even witnessed other barrel racers seem to put forth a lot less effort, and achieve much more success. I DO admire you for striving to be the best. But being a top barrel racer means you must stop looking for answers in all the wrong places. In a mystery story a “red herring” is the misleading information that keeps the detective from discovering the truth. The truth is – barrel racers are often misled. …while the mystery – the slow times, the tipped barrels, etc. continue. It means shining light on what’s really and truly necessary for you to STOP dreaming about barrel racing success, and start LIVING IT. It’s probably not what you think; which is why I consider the contents of my book “secrets” – because it’s NOT common knowledge, and it’s certainly not common practice. Honestly, if all you focus on is barrel racing, you’re severely limiting yourself. Reaching the highest levels of competition requires a strong commitment to development in many areas. It’s true that the insights I’ve compiled were gathered throughout years of intense training and competing in rodeos, 4D’s, and futurities. Some of the most valuable secrets, however – those that transformed my barrel racing the most, were gained through my education and career as a Licensed Vet. Tech., training for and competing in reining events, starting colts, rehabilitating troubled horses, riding with some of the world’s best horsemen, and through a long-standing commitment to personal development. I certainly won’t hold you back from spending 30+ years (and many, many thousands of dollars) doing all the same things, because you would gain A LOT from doing so. But the good news is that because I did – you don’t have to. If you’re anything like me, you probably already have every book on barrel racing ever written – collecting dust on your shelf. You probably have a collection of training DVD’s too. If they had what you were looking for – would you be reading this right now? This BOOK is DIFFERENT.In Secrets to Barrel Racing Success, I’ve revealed the truth. That’s why Secrets to Barrel Racing Success contains only quality, difficult to find information, that’s easy to understand and apply. I know exactly what it’s like to spend A LOT of time and resources on something you’re passionate about, which is why I intended for this book to be an investment that would pay for itself over and over. You no longer have to sort out and make sense of what Secrets to Barrel Racing Success has finally made clear. Sense and correct subtle mistakes on the pattern quickly and easily. Utilize specific conditioning techniques to make any barrel horse faster. Realize what “feel” really is, and how to harness its power for more fluid turns. Achieve optimum barrel racing performance, through optimum horse health. Get your horse’s full attention so he’s mentally focused when it matters most. Communicate in a way that creates feather-light, quick responsiveness. Understand true collection, how to achieve it, and why it’s necessary to be FAST. Learn how to become a rider and competitor that brings out the best in any horse. Master your inner game for confidence every time you blast down the alley. 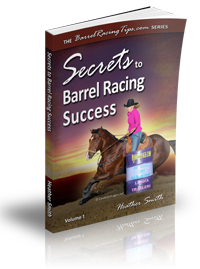 In Secrets to Barrel Racing Success I share how you AND your horse can both WIN. “With everything that I have learned, we performed the BEST run we have EVER, EVER, EVER had on Saturday!! I had goose bumps from head to toe and was brimming with confidence! I have been relying on your book and look where it’s got me, I now have a horse running 1D times and have now performed the best run I have ever done on her. She was so sooo responsive, thank you heaps for your help!” – Ruby H.
“I wanted to tell you how much your book means to me. I have read this book twice in less than a month and have hi-lighted and marked pages… My family trains horses for a living and I’ve been riding since I can remember. I was recently gifted with a three year old Quarter Horse and this has been the most frustrating experience of my entire life! Of course, being a barrel racer myself, I know barrel racers. I know they can be a skeptical crowd. Actually, I’ll be the first to warn you, that Secrets to Barrel Racing Success NOT for everyone. If you are looking for shortcuts and quick fixes, this is NOT the book for you. Whether you have NFR dreams or local jackpot aspirations, Secrets to Barrel Racing Success is for those that love barrel racing and have a sincere, burning desire to be their best. Since it’s release in 2012, “The Secrets” has created positive results for many thousands of barrel racers at ALL levels, all over the world. “Just wanted to let you know that your “Secrets” book is awesome! It totally covers what no other book does. What I’ve read covers the true secrets to barrel racing success – that are not obvious, but are really all about how far you are willing to challenge yourself and your horse to be the best you can be!” – Jeana W.
“I absolutely LOVED your book. I am so thankful for your insights… I feel like I am on the same journey, and by reading your book I have been fast-forwarded. I know that I still need to grow personally to overcome my struggles. My heart aches to be back on top again, and I won’t stop trying. Thank you for your inspiration!” – Stephanie W.
“I just finished “Secrets to Barrel Racing Success” and I would like to commend you on bringing many concepts to the table that aren’t in any of the other books on our sport. It’s perfect for anyone who doesn’t think they need “another barrel racing book! !” The concepts are absolutely crucial to our success – in and out of the arena.” – Sharyl N.
It couldn’t be a better timing for you to pull back the curtain on your BEST SELF AND unleash your horse’s potential. In fact, if you order “The Secrets” NOW (by completing the three simple steps below), you’ll instantly receive The Barrel Racer’s Guide to SPEED Development – a very special, one of a kind PDF e-book, as your FREE gift from me. The “Barrel Racer’s Guide to Speed Development” explains the foundational qualities of speed with a detailed comparison of two horses – one that’s FAST, and one that’s QUICK (there IS a difference)! The Speed Guide will help you determine which quality your horse lacks, AND how to develop one OR the other. This FREE PDF guide even includes three different conditioning schedules based on your horse’s individual needs. Most importantly though, it warns of specific precautions to take so that you don’t make common mistakes that prevent your horse from fully expressing SPEED on the pattern. This gift is my own way of going the extra mile and saying “thank you” for taking the ride with me. You were NOT given a dream, without also being given the power to make it come true. is waiting for you.I’d love to help you discover the winner that has been there ALL ALONG. Just follow the THREE EASY STEPS below to order Secrets to Barrel Racing Success and you’ll receive your FREE copy of The Barrel Racer’s Guide to Speed Development instantly via email. STEP ONE: Click one of these two options to purchase Secrets to Barrel Racing Success. STEP THREE: Check your email for a message containing a special link to download The Barrel Racer’s Guide to Speed Development. Thanks again for saddling up with me! P.S. 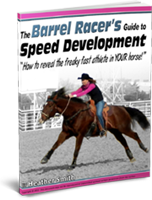 Click here for instructions on how to add The Barrel Racer’s Guide to SPEED Development to your Kindle or e-reader.